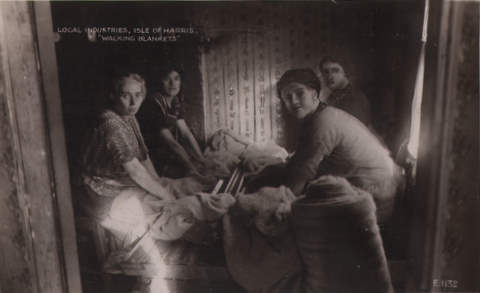 Tomorrow in the Old School, Shawbost, the Islands Book Trust is hosting an event called ‘An Clò Mòr, An-dè, an-diugh agus a-màireach’ celebrating the centenary of Harris Tweed. The event is open for registration from 9.30am and features a talk from Fiona Anderson of the National Museums of Scotland and ‘Stories of Harris Tweed’ – a light-hearted and wide ranging Cèilidh session. Check out the flyer here to find out more about what looks to be a very interesting day. This entry was posted in Uncategorized and tagged An Clo Mor, Harris Tweed, Islands Book Trust. Bookmark the permalink.